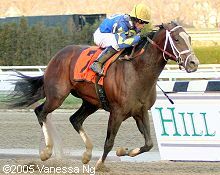 The $350,000 Hill 'n' Dale Cigar Mile is the last Grade 1 event of the year in New York and was renamed in honor of Cigar as it launched his 16 race win streak back when it was the NYRA Mile. A field of eleven older horses went to post in this 1 turn event over the Aqueduct main track before a chilly live crowd of just 4,484. Badge of Silver was the lukewarm 5-2 favorite despite finishing seventh last time out in the Stephen Foster Handicap at Churchill Downs. Also in the field were 9-2 second choice Scrappy T and 6-1 third choice Silver Wagon. When the gate opened, jockey Joe Bravo hustled 55-1 longshot Value Plus to the front and led the field down the backstretch through fractions of 22.72, 45.08, and 1:09.11 while staying off the rail. Jerry Bailey kept the favorite Badge of Silver in second, just a length and a half behind. Rounding the turn, Badge of Silver tired and dropped out of contention as 10-1 shot Mass Media, who had stalked the pace in third, closed the gap and got a half-length ahead of the tiring pacesetter Value Plus with a furlong to go. However 25-1 shot Purge, who was unhurried in ninth for the first half mile, was closing strongly after splitting horses on the turn and drove right by Mass Media at the 1/16 pole to win going away by 3 3/4 lengths. The winning time was 1:34.26 over the fast main track. It was just 3/4 length back from Mass Media to late-running 7-1 shot Gygistar in third. 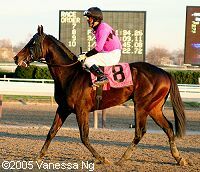 This was the last race for Purge, who will stand at Vinery in 2006, and he finished his career with a record of 6 wins in 15 starts and earnings of $905,434. Also on the card Saturday were the Remsen and Demoiselle Stakes plus the Top Flight Handicap for the fillies on Friday. Get the results and photos for those races here. Purge in the winner's circle. It was the first Cigar Mile win for jockey Garrett Gomez who said, "I tried to thread my way through. He started picking them up handily. I turned for home, gave him some daylight and he started picking them up. He went into overdrive. He acted like he had been doing that all his life, sitting there like an old come-from-behind sprinter. Going into the turn, I was a little worried because Todd (Pletcher) told me that he spits twelves (12-second furlongs), and I had never ridden him. I wasn't sure if we had too much to do." Purge in the post parade. 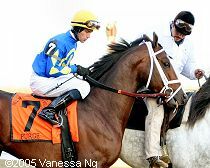 It was second consecutive Cigar Mile win and third in five years for trainer Todd Pletcher who said, "I realize more why he did what he did today and why we didn't do better with him the rest of the year. We were waffling back between the Clark Handicap (at Churchill Downs) and this. 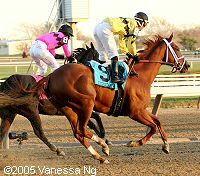 (Jack Wolf, owner of Starlight Stable) was very optimistic about this race, and the horse made him look smart." Second place finisher Mass Media returns after the race. His trainer Bobby Frankel, who also trains beaten favorite Badge of Silver said, "Mass Media ran a nice race. He always runs well. It's too bad that Purge had to run so big today." His jockey Alex Solis said, "He ran pretty good. I thought I had them at the quarter-pole. The winner just ran a better race." 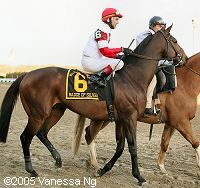 Mass Media retires with a career record of 6 wins in 17 starts and earnings of $466,420, and will stand at Hill 'n' Dale in 2006. Third place finisher Gygistar catches Purge during the run-out after the race. Eighth place finisher and beaten favorite Badge of Silver in the post parade. 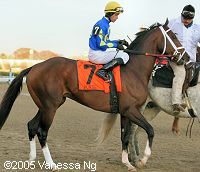 His trainer Bobby Frankel said, "I don't know what happened to Badge of Silver. Jerry (Bailey) had to try to keep him up there. He just didn't have it today. Maybe I breezed him too fast." 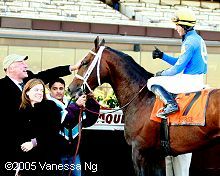 His jockey Jerry Bailey added, "At no time did my horse have any run."